There are two foreseeable opportunities for a breakout in federal funding for cancer research, according to Erik Fatemi, Vice President, Cornerstone Government Affairs. One, during Congress’ “lame duck” session, which ends December 11, legislators will, presumably, make a decision to pass either a year-long budget or a short-term continuing resolution. Two, Congress will soon reconsider whether to raise budget caps for nondefense spending, including biomedical research. Either way, Fatemi said, cancer researchers have a good story to tell, and they should tell it. Erik Fatemi discusses the changing landscape for federal funding of biomedical research during the 2014 AACI Annual Meeting. At the panelist table is Dr. Patrick J. Loehrer, director, Indiana University Melvin and Bren Simon Cancer Center. Fatemi provided an outlook on National Institutes of Health funding during AACI’s 2014 Annual Meeting, held in Chicago at the end of October. Before joining Cornerstone, a Washington, D.C.-based consulting group with offices in seven other cities, Fatemi served 12 years as a senior staff member on the Senate Appropriations Subcommittee on Labor, Health and Human Services, and Education under Chairman Tom Harkin (D-IA). He also served as the subcommittee’s staff director from 2010 – 2013. 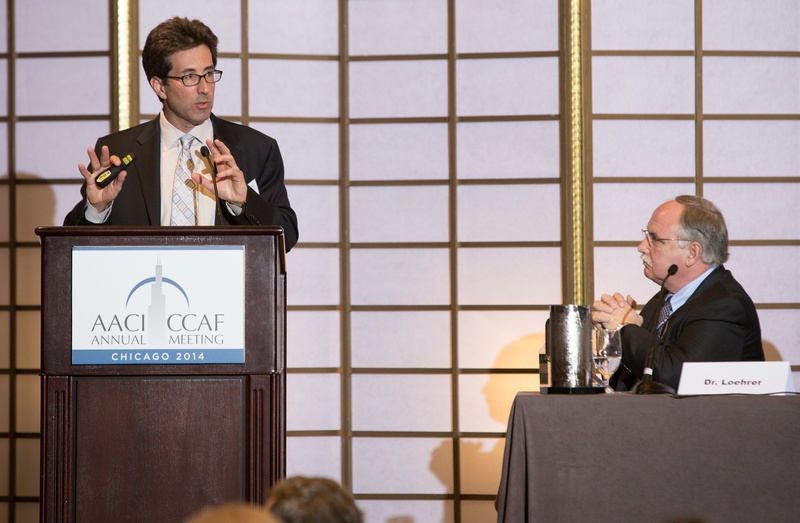 Fatemi urged meeting attendees to invite a member of Congress to their own cancer center, noting that it would make the lawmaker proud to be representing such an important enterprise, and it may give them incentive to fight for NIH funding. Fatemi recommended that cancer researchers explain what they would love to do with their research, if sufficient funds were available. Putting NIH in the context of overall government funding, Fatemi explained that “discretionary appropriations,” which include NIH, are divided into 12 annual appropriations bills, the largest of which, the defense appropriation, covers about half of all discretionary spending. NIH is a large component of the Labor, Health and Human Services bill, comprising about one-sixth of it. However, NIH struggles to compete for funding with other good priorities within the bill, like education. 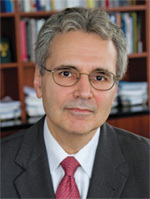 Since its budget was doubled between 1998 and 2003, NIH has lost almost a quarter of its purchasing power, Fatemi noted. Hopeful that the word is out and that legislators realize there is a serious problem with biomedical research funding in this country, Fatemi said he believes that NIH can succeed in attracting more support, despite the tight fiscal environment. Growing concerns about the impact of budget cuts on young researchers, innovation, and global competitiveness may set up NIH as an exception to Washington’s budget-trimming ways. Fatemi noted that the recent Ebola outbreak created a new wrinkle in the bipartisan support for NIH funding, with Democrats and Republicans clashing over the impact of budget cuts on the development of a vaccine. But he said he hoped that controversy would settle down soon. In budget recommendations released March 4, President Barack Obama requested an increase of less than 1% ($970 million) for the National Institutes of Health (NIH); $200 million above Fiscal Year 2014, but a funding level below that of FY12. The proposal includes $4.931 billion for the National Cancer Institute (NCI), an increase of $7.5 million (0.2 percent) over FY14. AACI greatly appreciates the president’s ongoing strong support for biomedical research and his willingness to increase NIH funding. However, his budget proposal falls far short of the inflation rate of 2.9 percent, a figure that NIH projected last year for the Biomedical Research and Development Price Index (BRDPI) for FY15. AACI recommends a NIH budget of $32 billion for FY15 through the Labor-HHS Appropriations Subcommittees, nearly $2 billion more than the president’s proposal. A flat budget for NIH, and ultimately the NCI, will only slow innovation and discovery. Speaking last month at a meeting of the AACI Government Relations Forum at the University of Texas MD Anderson Cancer Center, in Houston, center president Ronald DePinho, MD, underscored the need for increased federal funding for cancer research, noting that cancer incidence in the U.S. is projected to increase 45 percent between today and 2030.